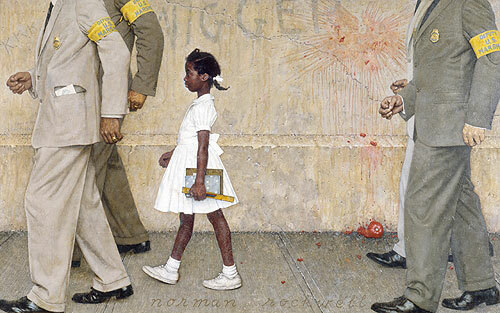 There is well known Norman Rockwell painting of Ruby Bridges, the six year old who integrated New Orleans schools in 1960. Her contribution to history was an important one, but it was not an easy one for either her or her family. Every morning, an angry mob shouted threats and ethnic slurs. She was escorted to and from school each day by federal marshals, and she was the only black student in the entire school. Robert Coles, a young psychiatrist, worked with her for that entire school year, and he later wrote a Pulitzer-prize winning book. Alexander Pope said, “To err is human, to forgive divine.” When we see forgiveness like that of little Ruby, we can know it is a reflection of divine forgiveness of God. Humans can learn to forgive, but only because God is the God who forgives. In Luke 15, Jesus tells three stories that speak of God’s forgiveness. The Pharisees are shocked that Jesus would welcome sinners. Jesus’ response is simply that welcoming sinners is what God is all about. The point of the parables of the lost sheep, coin and boy (prodigal son) are really the same—God rejoices when the lost are found. God is a God who majors in forgiveness. Want to be like God? Forgive someone. Forgiveness truly is divine.